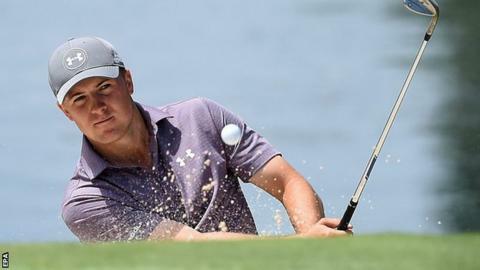 World number one Jordan Spieth is four shots behind leader Matthew Jones after two rounds of the Australian Open. American Spieth shot a three-under-par 68 to move three under for the tournament and into a share of third place in Sydney. Jones followed his first-round 67 with a 68 to open up a three-shot advantage over fellow Australian Todd Sinnott. Northern Ireland's Darren Clarke trails Jones by seven strokes after carding a four-under-par 67 to move to level. Englishman Lee Westwood is also at level par after a one-over 72 at the Australian Golf Club, while last-placed China's Weiyu Zhu followed his opening-round 92 with an 85 to close on 35 over par. Spieth, 22, started the day five shots behind overnight leader Lincoln Tighe, whose two-over 73 saw him slip to joint third in a five-strong group also featuring Belgian Nicolas Colsaerts and Australians Geoff Ogilvy and Aron Price. Aiming for his sixth Tour victory of the year and defending the title he won by six strokes last season, Spieth shot five birdies but struggled late on with bogies on the 15th and 16th. "It's frustrating," he said. "I was striking the ball well, but you don't see this much cross winds on golf courses. It is tough to deal with."